Location, history, and style. 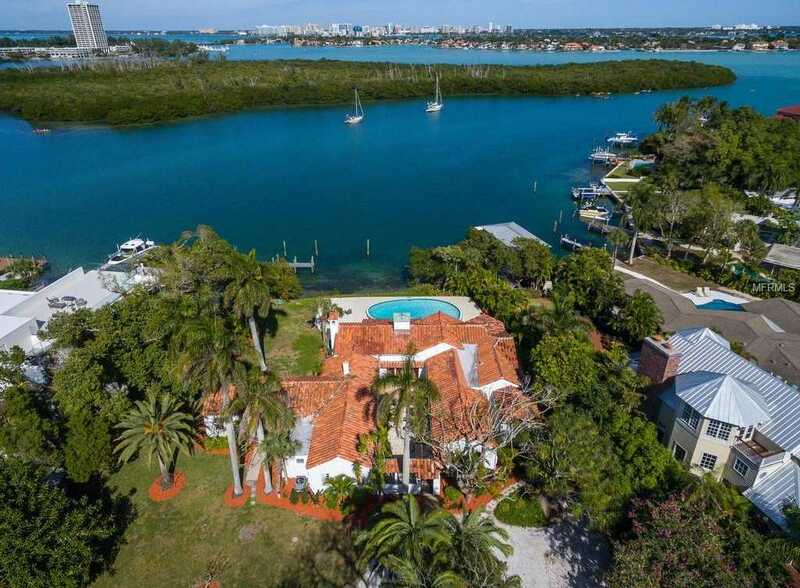 The Historic Van Wezel Estate, one of the first homes built on Lido Key, is sited gracefully on tranquil bay waters just steps from the bustle of St. Armands Circle, the beaches of Lido Key and minutes from Downtown Sarasota. Upon entering the front courtyard, one is transported to an authentic Mediterranean waterfront villa with original Saltillo terra cotta tile, wood beamed ceilings, arched entryways, wood panel molding and stunning French doors that open to the beautiful waterfront covered patio and pool area. This Mediterranean Revival Style residence was designed for Lewis and Eugenia Van Wezel by well-known architect, Thomas Reed Martin and was caringly updated to include an amazing state of the art kitchen featuring large rectangular island, marble countertops and backsplash, Viking professional grade stainless steel appliances, and La Cornue 6-burner gas range and rotisserie. The family room addition is completely open to the kitchen and is light and bright with vaulted ceiling, abundant windows and sliding doors that open to the oversized patio area. The combined living and dining room boast a wood-burning fireplace and large banks of window and doors allowing for the gentle bay breeze to filter throughout the residence. Deep water boat dockage featuring two slips and direct access to bay and Gulf of Mexico waters beyond add to the list of amenities. Several plans have been created to further expand this historically designated gem. The lot is truly amazing. Please, send me more information on this property: MLS# A4427502 – $3,695,000 – 535 S Blvd Of The Presidents Blvd, Sarasota, FL 34236. I would like to schedule a showing appointment for this property: MLS# A4427502 – $3,695,000 – 535 S Blvd Of The Presidents Blvd, Sarasota, FL 34236.